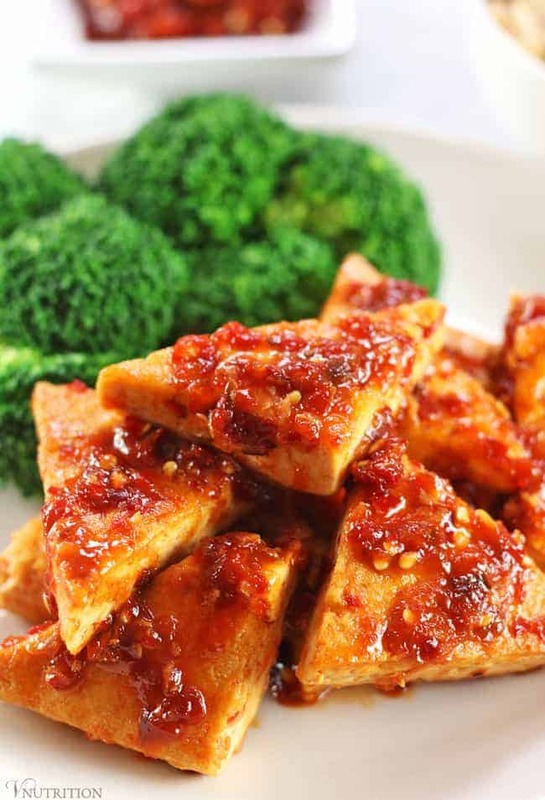 Crank up the heat in your dinner with this Tofu in Chili Garlic Sauce! It’s perfect for spice-lovers and it’s so easy that you can have it on the table in about 15 minutes. Do you like some heat in your foods? 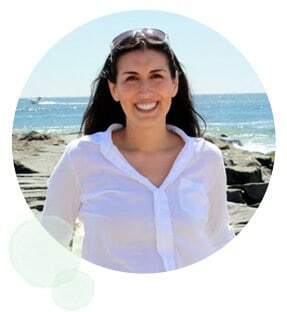 If you’ve been reading my blog for a while, you know I do! I love anything and everything hot: Buffalo Quinoa Balls, Spicy Sesame Noodles, and Buffalo Chick’n Rice Skillet are just a few of the spicy recipes I’ve shared. Most of the time I add a small amount of heat to my recipes because I know everyone is not as hot-crazed as I am. Today, however, I have a no-nonsense, lets-get-this-spicy-party-started meal for you hot & spicy people – my Tofu in Chili Garlic Sauce. I used Sambal Oelek for the heat in this Tofu in Chili Garlic Sauce. Sambal is a sauce originating in Southeast Asia and made of hot red chili peppers with some salt and vinegar. It’s one of my Vegan Kitchen Staples. Most store-bought brands do contain preservatives so if you’re not into that, you could make your own. I found this recipe that looks good. I’m going to try it soon but for now, I don’t use it all the time so I don’t stress too much about the store-bought kind. This recipe actually came to me by accident. I was making some tofu and I wanted to add a little spice to the sauce. I tipped the bottle of sambal oelek over my sauce base to add a tiny bit and a whole bunch fell into the sauce. 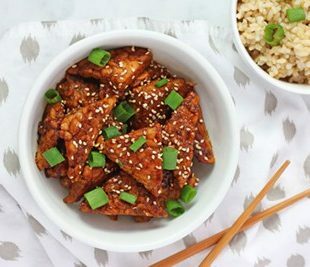 Never one to shy away from a little extra heat (and let’s be honest, I was being lazy not wanting to spend the 1 minute redoing the sauce), I decided to buckle up and try the tofu. I’m so glad that I did because, although it was hot, it was also delicious. I had to tone down the heat a bit for the recipe, even for you hot-sauce lovers out there because it was almost too overwhelming even for me. 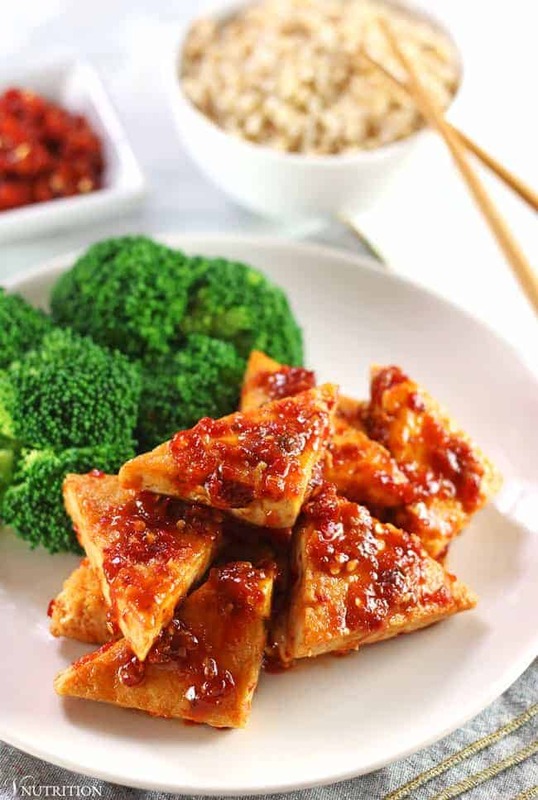 But don’t worry, this Tofu in Chili Garlic Sauce is still hot! For those of you with less of an inclination towards heat, you can cut down to 1 TB. It will still be just as tasty, though not as spicy. For those of you not into tofu I’ve use this sauce on veggies like broccoli and and bok choy and really enjoyed it too. Share your pictures of my recipes on Instagram and use #vnutrition or tag @v.nutrition so I won’t miss it! Post your photos on the VNutrition Facebook Page as well! 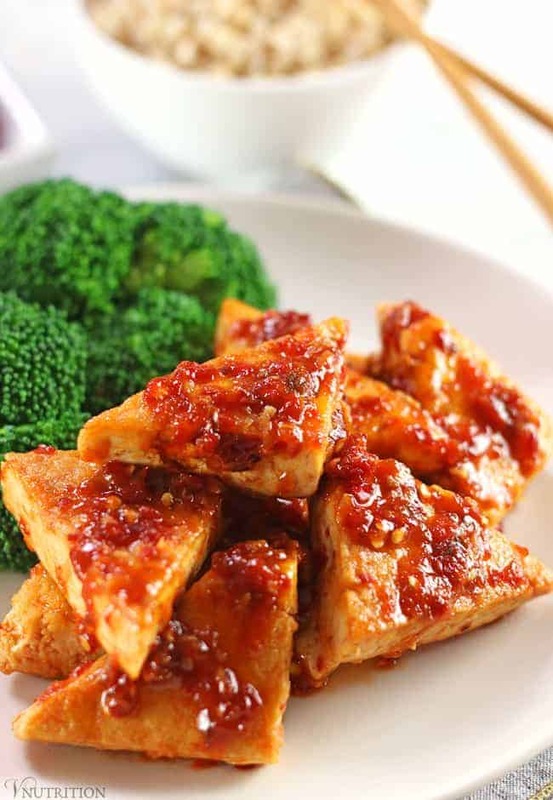 Crank up the heat in your dinner with this Tofu in Chili Garlic Sauce! It's perfect for spice-lovers and on the table in about 15 minutes! 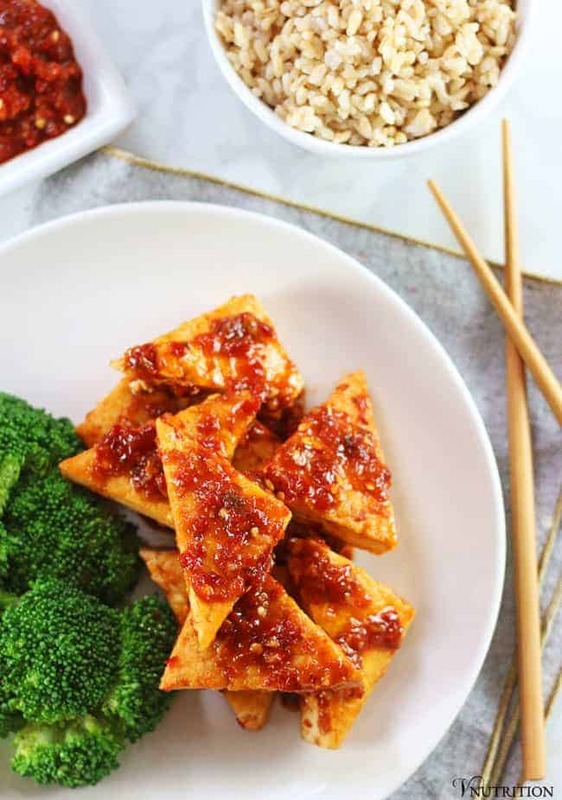 Cut the pressed tofu into squares or rectangles. I cut it in half through the middle first keeping the same shape but making it thinner, then I cut them into triangles. Heat olive oil in a non-stick pan and fry the tofu on medium heat about 5 minutes. Flip tofu and cook for another 5 minutes until both sides are browned. 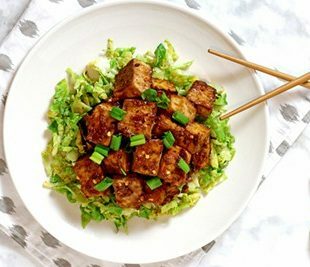 While tofu is cooking, combine all sauce ingredients in a bowl, whisk, and set aside. Once tofu is cooked transfer to a plate. Add the sauce to the pan and heat on medium until bubbling. 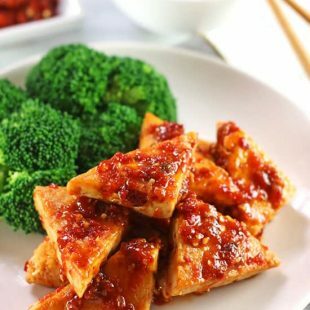 Add tofu back into the pan with sauce and cook for 1 minute. If you don't like things too hot, use only 1TB of sambal oelek. Oh, I love hot and spicy foods too. I know I would be all over this! It sounds like it was a happy accident indeed. My favorite accident in a while! Yes! Love the looks of this recipe! Chili garlic sauce is so good! I just got back from the store with tofu, but I just realized I forgot the sambal! I’ll have to pick some up very soon. This is such a great recipe! I love using gallons of chili sauce and paste in my asian meals, so good! It looks lovely but a tsp of the sambal oelek will probably do me! Yes, I love sambal oelek too, or anything spicy! Such a perfect compliment to tofu. I love how you made a chili garlic sauce with such minimal sugar – usually those store bought sauces are loaded with it! I’m such a spicy person too! Thanks, a little sweetness is tasty but too much is overwhelming. Oh, this looks amazing Mary Ellen! I will have to give this a try as both Andrew and I love experimenting with tofu. Yum, I need to get sambal oelek because we are obsessed with spicy here. This looks perfect, thanks! Thanks Christine! I’m spicy obsessed too! Yum! I love spicy sauces and this sounds so good. 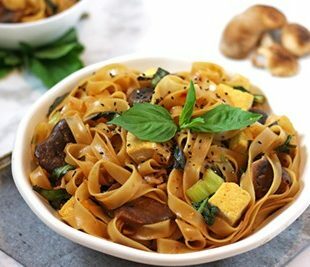 This is such a great recipe for a busy weeknight when you want something healthy and fast. Thanks Linda! Yes, it’s really easy to get on the table fast! I need to buy more Sambal Oelek. This looks so tasty! This definitely looks like my sort of tofu! Yum. I love tofu so much! This looks so amazing—that sauce! As a proper hot and spicy food lover I cannot believe that I haven’t tried sambal oelek!! At least not in my own cooking. I might have eaten it in restaurants without realizing I suppose. I have just added it to my shopping list and will be making this when I get it. Can’t wait! Accidental recipes are so fun! Yes, I know you love spicy so you need to get on sambal oelek!! I clicked on this post because I wanted to see what you used for the sauce- I’ve never bought Sambal Oelek, but it sounds delicious! I will have to try it out soon with some veg, since my system can’t really handle tofu anymore:( The video was so cute too! Wow! This sauce seems like a great side dish and I can’t wait to give it a try! Is it possible to use honey instead of maple syrup? Hi Agness, thanks! I would think you could substitute honey for the maple syrup. I haven’t tried it but I use maple syrup in place of honey in recipes so it should be totally fine. You had me at Garlic!!!! !